Speeds of up to 10Gbs for businesses in Guildford to Goldaming available NOW! We are an Internet Service Provider (ISP) based in Bramley, just outside Guildford. We deliver ultrafast full-fibre Internet services to demanding business customers, and create rural fibre network in and around the Surrey Hills over our own full-fibre network. We describe our network as ‘smart’ as we take advantage of existing telecom infrastructure and our own deep knowledge of the local area to deliver full-fibre broadband services on a cost-effective and highly resilient basis. As a result, customers can benefit from future-proof and synchronous full-fibre connections offering industry leading internet speeds of up to 10Gbs. In the more rural and poorly served areas of the Surrey Hills (so-called ‘not-spots’), we work with small communities and landowners to deliver our own self-dug full-fibre broadband services to businesses and homes. Working in this way, we remove the distance issues affecting traditional broadband services and keep costs down by ‘soft digging’ which avoids expensive public highways. Surrey Hills Internet is an approved supplier with the latest Government Gigabit Voucher Scheme commencing in March 2018, offering free installation worth up to £2,500 for small and medium-sized businesses. 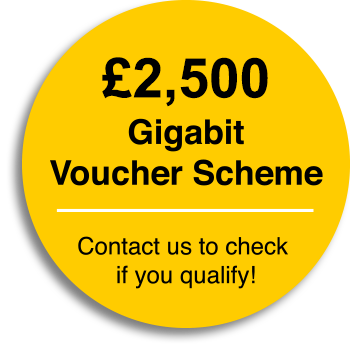 Full details on eligibility can be found on our Gigabit Voucher Page. While Surrey Hills Internet was founded in 2017, we have industry pedigree stretching back to 1999. Our CEO Richard Elliott combines a practical operating background with strong knowledge of the public and private capital markets. Following the sale of Band-X, a company he’d founded in 1997 he became a non-exec then Managing Director of the Apollo Submarine Cable System which was acquired by Vodafone in 2015. Tim Anker our Business Development Director has lived in the Surrey Hills area since 1971. He founded and runs both Crosspoint Colocation and The Colocation Exchange Ltd in 2004. Crosspoint has been supplying a full fibre internet service to a school in Peaslake since 2014. Our Technical Director, Oliver Helms, founded Sugarnet, an ISP serving rural Oxfordshire over both fibre and wireless. Sugarnet was acquired in 2017.